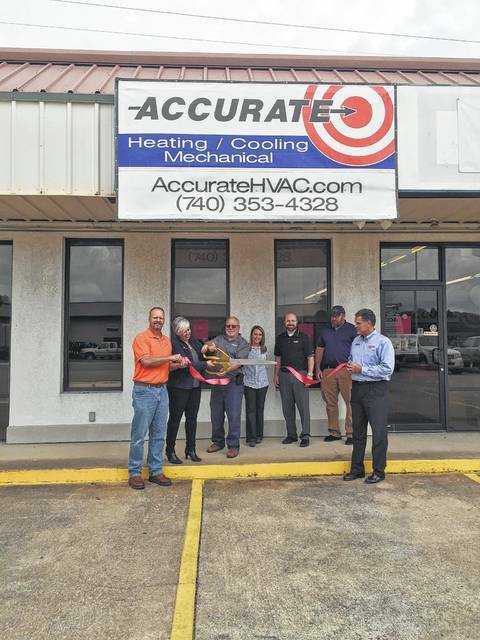 Charlie Workman, Rochel Wolfe, Chuck Martin, Hannah Allen, Bob Orsini, Tom Martin, and owner, Michael Linton cutting the ribbon for Accurate Heating and Cooling in Wheelersburg. Moving of any kind, is not usually easy , but Accurate Heating and Cooling, of Portsmouth, has moved to a new home located at 8732 Ohio River Road in Wheelersburg, seems to be up to the challenge. And, on Friday, September 15, 2017, they had a grand opening ceremony and 40th Anniversary to help them begin their successful endeavor, now located in Wheelersburg. Hannah Allen, the customer service representative of Wheelersburg was greeting guests at the door for today’s opening. Since 1977, Accurate Heating and Cooling has been providing heating and air conditioning replacement, installation and repair services to both residential and commercial customers throughout Chillicothe and South Central Ohio area. Tom White, who has been in business for the entire 40 years, is the president and owner of the company and still works for them. His son, Brian works for the company also. Michael Linton is the other owner of Accurate along with a White. Linton, is what he called the ‘newbie.’ just joining the ownership of the business seven years ago. Wolfe added they have been here, in Wheelersburg for a week and half to two weeks just to get ready, and they are happy to be here, happy to be in Wheelersburg. Friday’s celebration was scheduled from 11-3 p.m. and the people of the Accurate of Wheelersburg had prepared a table with gifts and things to be given away. People also could join the team at Accurate in a home cooked meal. There were balloons and streamer garnering the room, plus they had a cake and cupcakes to commemorate this new opening of the building. Finally attending this opening, carrying the scissors and ribbon, was Lisa Carver from the Chamber of Commerce. Carver said she wished them luck in their new location. She then got all of them together to successfully cut the ribbon and get Accurate Heating and Cooling up and ready for business. https://www.portsmouth-dailytimes.com/wp-content/uploads/sites/28/2017/09/web1_IMG_1478.jpgCharlie Workman, Rochel Wolfe, Chuck Martin, Hannah Allen, Bob Orsini, Tom Martin, and owner, Michael Linton cutting the ribbon for Accurate Heating and Cooling in Wheelersburg.